Something dangerous and scary is probably occurring right now at a university or college near you. It may be disguised as a seminar on wellness, a class on well-being, or a conference on integrative health. You might find it listed in the college catalog in courses labeled “Mindfulness Training” or “Contemplative Learning.” It could more blatantly be offered as a program for student/faculty that utilizes yoga, Tai Chi, or meditation as an aid to mental and physical health. And usually somewhere in the literature for this seminar, class or program you will find references to the “wealth” of scientific evidence that proves that mindfulness (or yoga, or contemplation, or whatever) is proven to be the panacea for all ills in body and soul. In our local environment (I live in central Virginia) we have our own version of this trend. It is called the Contemplative Sciences Center (CSC). This is a heavily funded initiative at the University of Virginia. The funding comes from hedge-fund multi-billionaire Paul Tudor Jones, and his yoga-loving wife, Sonia. The Joneses have pumped millions of dollars into the CSC with the intent of making yoga, mindfulness and other “contemplative sciences” available to the staff, faculty, and students of UVA. Their goal is to integrate contemplative practices in all the various colleges of the University, for yoga and meditation to become part of the everyday life at UVA. Beginning only in 2012, they have (unfortunately) been very successful. It is disturbing for Eastern religion to be promoted in a state-funded school of higher learning. (What a wonderful example of our tax dollars at work!) It is frustrating that Hindu and Buddhist beliefs and practices are allowed free reign in our schools, yet if we dare pray in Jesus’s name it is considered “un-American” and anti-Constitutional. Yes, all this is greatly upsetting. And there many things we could say about how disconcerting this is. But there is one aspect to this whole “mess” that I want to consider today. It is the pseudo-scientific patina glowing on the surface of the whole phenomenon. What we are now experiencing is a weird amalgamation of science and the supernatural. In a real way, we have returned to the magical beliefs and experimental sorcery of the late Middle Ages and the Renaissance. Our scientists talk like sorcerers, and our religious gurus use the jargon of science. Subtly and slowly, yet inexorably, over the past few decades we have returned to the world of Paracelsus and Cornelius Agrippa. 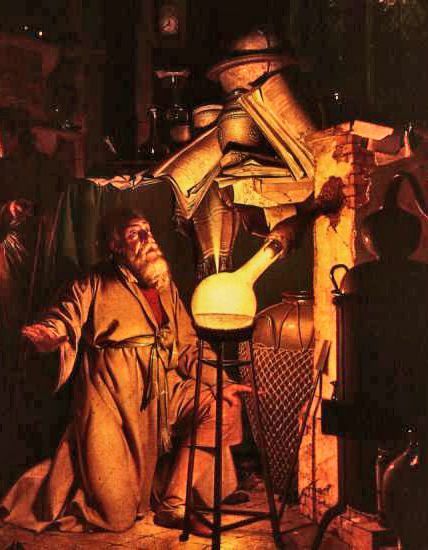 We are like Isaac Newton, propounding scientific theories by day and practicing alchemy by night. We are modern-day scholastic magicians. In the ministry of Truth Builders I deal with the occult quite a bit. The growing presence of occult belief and practice in our culture is one of my greatest concerns. Concomitant with this is the increasing presence of eastern mysticism in our society. This is not surprising—both worldviews are very similar. This growing presence is an alarming trend. And what makes it even more alarming is that metaphysical principles and concepts are being packaged in a way that makes them seen scientifically valid and acceptable. I believe it is this mixture of science and the supernatural that is especially perilous for our culture. Ever try to talk to people living in this particular world? It is hard to argue against supernatural experience that is supposedly substantiated by scientific theory. This trend pops up all over the place. Books such as The Tao of Physics by Fritjof Capra and The Dancing Wu Li Masters by Gary Zukav assert that modern physics and the theories of quantum mechanics have definite parallels in Hindu and Buddhist beliefs. ESP and the paranormal have been studied as scientific disciplines in universities like Duke and UVA for the past 80 years or so. Grant money is being expended so university professors can study children who purportedly have memories of past lives. Reincarnation has become science! And now the benefits of meditation, yoga and mindfulness are considered medically verifiable. Indeed, they have become required disciplines in many schools for the health sciences. Insight on this situation can be found in the writings of C. S. Lewis. Lewis was an amazing writer. So much of what is occurring in western culture today was foreseen by this prescient author. The Abolition of Man deals with the shift in worldviews that Lewis saw happening in the educational field of the 1940’s. Lewis further expounded on these matters in the final volume of his fictional Space Trilogy, That Hideous Strength. This work is virtually prophetic. I won’t take time to discuss the plot of this book. I suggest you read it for yourself. However, I mention That Hideous Strength because it paints a picture of the horrific threat to be found in the mixture of science and the supernatural. When academics and scientists begin toying with the paranormal, they are getting more than they bargained for. They do not realize that there are genuine spiritual entities behind the phenomena they are studying and promoting. Yes, as Medieval as it may sound to some, there are demons and they are active in the world today. They are the actual forces behind ESP, mystical experiences and supernatural events. What this means is that we are opening our schools, our homes, our minds to the devilish in the guise of the scientific and the scholarly. Lewis also points out that this could not have happened in the early 19th century. Back then, naturalistic scholars were true materialists. Yet they still believed in truth, and that it was discoverable. They also still functioned within a moral framework, a Judeo-Christian consensus in society, although they may have rejected its particulars. They were a different breed from the scientists and academics of our day. Today we tend to be more postmodern. There are no absolutes. Everything is relative and existential. So we are open to any possibility—whether scientific or preternatural. Elements and elementals, algorithms and alchemy – all are acceptable, all are possible. God help us! We may be living in the day when we are seeing Hell incarnate. And there are (ironically enough) twin agents involved in the birth to this spiritual monster. Magic is the mother, and Science is the midwife.